Hillary Clinton has started her comeback/excuses tour to deflect blame from the terrible campaign she ran, which led the Democrats to lose what should have been a sure victory against Donald Trump. 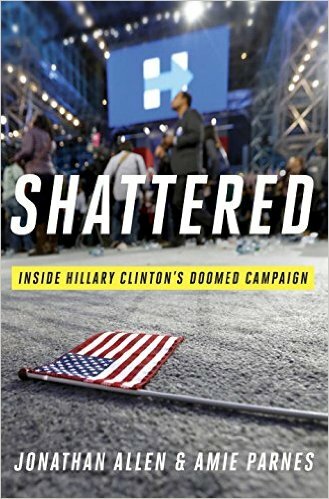 While Clinton continues to blame others for her mistakes, an excerpt of an upcoming book provides further evidence of how Clinton mismanaged her campaign. Almost four months after her stunning defeat, Hillary Clinton on Thursday primarily blamed her loss to President Donald Trump on four factors that were beyond her control. The former Democratic presidential candidate cited Russian meddling in the election, FBI Director James Comey’s involvement toward the end of the race, WikiLeaks’ theft of emails from her campaign chairman, and misogyny. Clinton ignores the fact that there would have not been a criminal investigation of Hillary Clinton if Clinton had not violated the rules regarding handling email, as documented in the State Department Inspector General report, and then go on to repeatedly lie about the situation, or if she had not handled classified information in an extremely careless manner. Similarly, Clinton would not have been harmed by the hacking of John Podesta’s email, or any other information allegedly released due to Russia’s actions, if the email did not contain such incriminating information about the actions of Clinton and the DNC. There has not been any evidence of any false information being released. The hacked email primarily acted to reinforce what Clinton’s critics had already been saying. Most of those who would not vote for a woman based upon misogyny are also those who would never vote for a Democrat, and all serious analyses of the election have demonstrated that Clinton’s poor campaign rather than misogyny are responsible for Clinton’s loss, despite attempts of Clinton supporters to make such claims. This is typical of Hillary Clinton’s long standing history of repeatedly making mistakes, and failing to learn from, or take responsibility for her mistakes. Hillary had been up into the wee hours the night before, agitating over her loss. This is because we made poor choices about where we traveled, she thought. She emailed Robby Mook to tell him she believed she’d spent too much time in the cities of Detroit and Flint and not enough in the working-class white suburbs around them. Sensing just how angry she was, Mook responded by putting together a morning conference call so that Hillary could vent. But that didn’t settle her; if anything, it left her more perplexed and angry, as her debate-prep team witnessed firsthand. Her aides took the browbeating — one of several she delivered in person and on the phone that day — in silence. They had a lot of their own thoughts on what went wrong, some of which echoed Hillary’s assessment: her message was off for Michigan, and she had refused to go hard against trade; Mook had pinched pennies and failed to put organizers on the ground; the polling and analytics were a touch too rosy, meaning the campaign didn’t know Bernie was ahead; she had set up an ambiguous decision making structure on the campaign; and she’d focused too heavily on black and brown voters at the expense of competing for the whites who had formed her base in 2008. The list went on and on. The underlying truth — the one that many didn’t want to admit to themselves — was the person ultimately responsible for these decisions, the one whose name was on the ticket, hadn’t corrected these problems, all of which had been brought to her attention before primary day. She’d stuck with the plan, and it had cost her. While the campaign projected a ­drama-free tenor, it was reminiscent of other moments of frustration. Months earlier, Hillary Clinton turned her fury on her consultants and campaign aides, blaming them for a failure to focus the media on her platform. In her ear the whole time, spurring her on to cast blame on others and never admit to anything, was her husband. Neither Clinton could accept the simple fact that Hillary had hamstrung her own campaign and dealt the most serious blow to her own presidential aspirations. It was a difficult task for the Democrats to find a candidate so poor that they would lose to a candidate as terrible as Donald Trump, but the Democrats, perhaps having a subconscious death wish, managed to do so when they rigged the system to nominate Clinton. Posted in Bernie Sanders, Donald Trump, Hillary Clinton, Politics, Scandals. Tags: Bernie Sanders, Donald Trump, Hillary Clinton, James Comey, Politics, Russia, Scandals, Shattered, Wikileaks. RSS feed for comments on this post.. TrackBack URL.